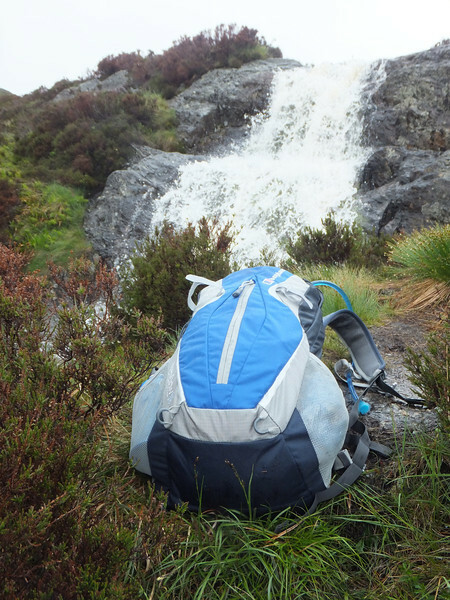 splendid isolation: Berghaus Freeflow 20 Rucksack - the sequel. 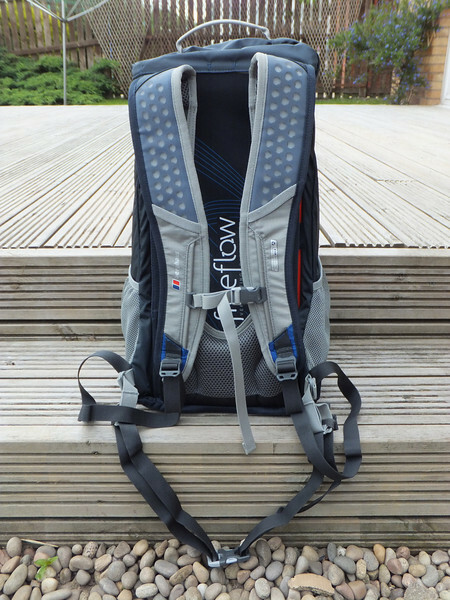 Berghaus Freeflow 20 Rucksack - the sequel. So, a couple of gripes about space and disappointing pockets notwithstanding...how is it to carry around? Like, up hills and that? The Berghaus Freeflow system is very briefly explained here. 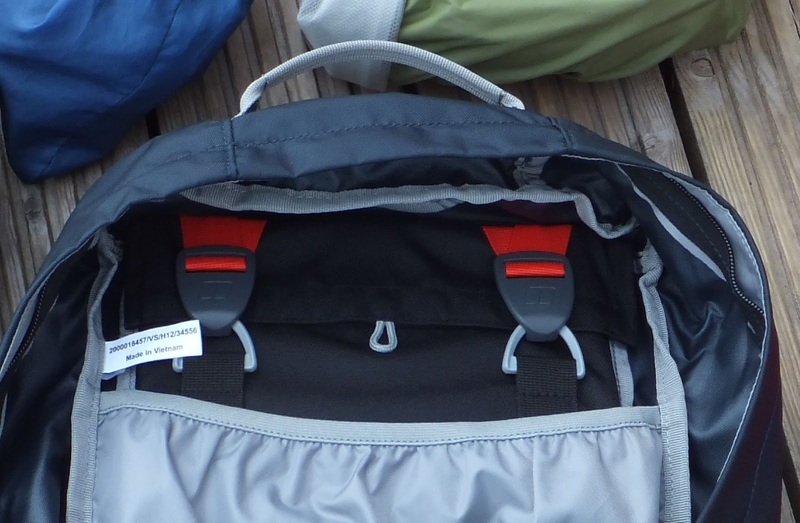 What the pack has is a precurved plastic stiffening panel which forms the inside of the "back" of the rucksack. The upper parts of the shoulder straps aren't actually stitched to the body of the pack; they hook over the top of the plastic panel via an arrangement that reminded me a bit of Bobby Ball's braces. Below that comedy connection point, the straps morph into narrow (but still sturdy) mesh affairs, and thereafter into a padded area, stitched to the bottom of the sack. Some sort of illustration would probably help at this juncture. It does that, no question. Whether this is something that is hugely important to the user is always going to be a matter of personal preference. The OMM Jirishanca that I use in the winter, and that Inov8 thing, don't make any attempts at air gaps or owt fancy. Simple foam padding that hugs your back. That doesn't bother me at all, and it seems a wee bit like the Freeflow set up is part of the reason that space inside is at a premium. Also, certainly in weather like I had on Ben Venue, if you're trudging uphill wearing your waterproof with your woolly hat on and hood up, the effect the lower back air gap is going to have on your actual comfort is moot. And it's a neat looking arrangement. Indeed it's a very neat looking rucksack, overall. I can't claim that when I put the sack on and left the Loch Achray carpark I wasn't enjoying the lighter than usual load. That was down to bringing less stuff, as opposed to the intrinsic weight of the pack, mind you - the OMM and the Inov8 ones are only about 300g heavier than the Berghaus thing. But - undeniably - it was the relative shortage of space that had led to that state of affairs. It took more footering (note to readers furth of Scotland - footering = fiddling/faffing) about than I had expected to get the pack comfortably positioned. The air gap arrangement holds it that bit further away than I was used to, so I needed the shoulder straps pulled pretty tight to keep it stable. That in turn meant it sat quite high, and the back length (it only comes in one size) resulted in the padding being a tad above my belt line, and there was an element of slight - very slight - annoyance/discomfort from the large raised seam that sits at the extreme bottom of the pack. I think the plastic stiffening plate must be attached to that as well, thus it's quite substantial. That aside though - and it wasn't noticeable once I had another layer on, higher up the hill - I really got on quite well with it after I'd found the optimum shoulder/belt strap combination. From that starting point it was a lot easier to make small adjustments for the parts of the hill that required a bit of gentle upwards activity as well as walking along the flat. It does cinch in quite pleasingly if you want extra stability for wee scrambly stretchy bits. The "vertical slider" arrangements for the chest strap are good, and don't tend to migrate away from the selected position on the move. The waist strap has a decent enough clip on it, although I found myself experimenting with it and more often than not I didn't bother doing it up other than extremely loosely, just to stop it flapping about. Too tight tended to bring the Big Raised Seam into play. The side pockets were just the job, and it was as easy to get stuff in and out while walking as with my Jirishanca, so that's praise indeed. 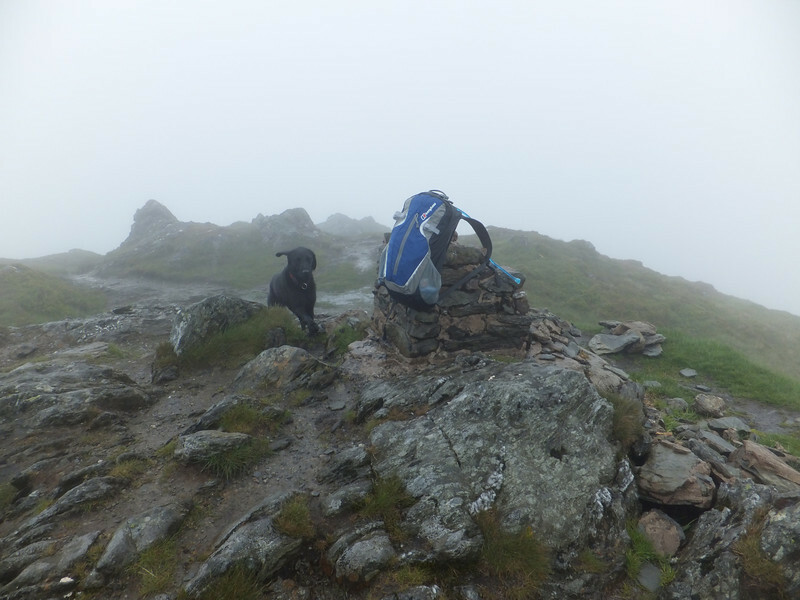 By the time I was descending, I was rather warming to the wee Freeflow, although it has to be borne in mind that apart from my waterproof trousers, I was wearing just about everything I had originally packed, my Sigg bottle was empty, and me and the dug had demolished the food supplies. To my mind, if the front pocket was even slightly useful - there seems no obvious reason why they couldn't have put a stretchy-type pocket on it - I'd have been a lot better disposed towards it from the off. All it really required, in truth, was for me to find somewhere realistic to put my hat & gloves. 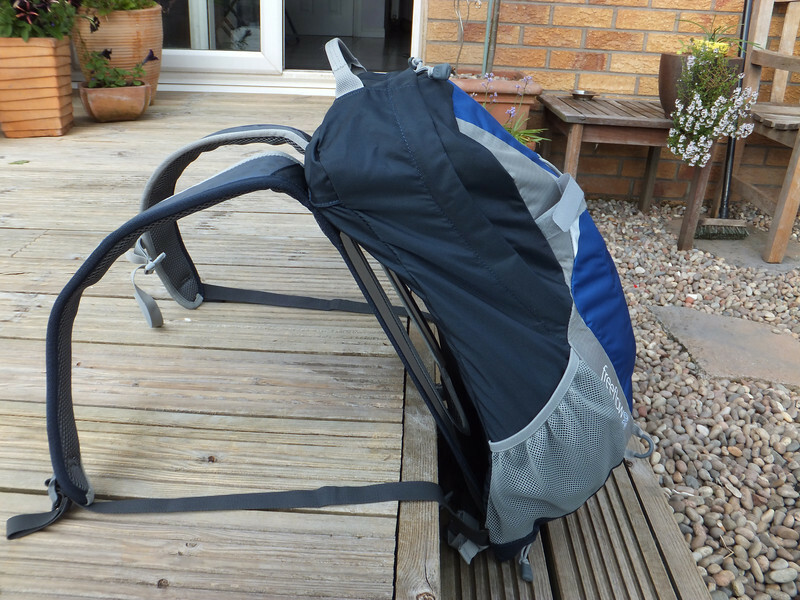 If, in addition, the hipbelt had pockets (particularly bearing in mind the lack of volume in the sack proper) then this would have been a different beast, and a considerably more practical one for the type of hillwalking I tend to do. If the intention was to make a "scaled down" version of a proper hillwalker's pack - and they know how to do those(!) - then some aspects have been scaled down a shade too far. 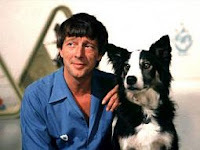 Still - I'll try it again on a less inclement day and report back. That Freeflow system might be a revelation in the hot sunshine. Don't hold your breath for that one though, given it's weather-dependent.